The whole night we hear small raindrops falling on the tent and in the morning we take our time until the tent is totally dry. Only around half past eleven we leave the campsite and we are sweating all over. It is 25 degrees but very humid in the air, very muggy. In Monfalcone we fill up our gas tank since we haven't any Slovenian and only a little Croatian money. But when we have to pay we know that we are probably being conned. We have to pay € 38 for almost 40 litera, the maximum of our tank. But the fuel meter was still over a quarter and we always paid about € 25 when it was on this level. But how do we explain this to the two shining boys who only speak Italian? Well, we take our loss and hope to have stimulated the world economy a bit by this. Quickly we cross the Slovenian border but from there we drive slowly in a traffic jam until the Croatian border. And even after that it takes along time before we pass Rijeka and see the coast of the Adriatic Sea. The temperature has dropped a lot in the meantime and there are a lot of clouds. Now and then some rain falls. We have been prepared for a long journey and we are glad we did since it is all going incredibly slow. There is a lot of slow traffic and taking over is almost not possible. The road is a series of curves following the coast and when you take over a vehicle you have to be carefull not to drive too fast, since there are many speed checks with laserguns, even on a saturday afternoon! The beautiful scenery makes it all up, although we can't remember the road being as bad as it is now. But there have been placed more guard-rails which is very reassuring along the steep ravines. Last year there were only big stones every 5 to 10 meters along precipices that sometimes go straight into the sea. Now and then the sky becomes a bit clearer and the temperature is rising again. 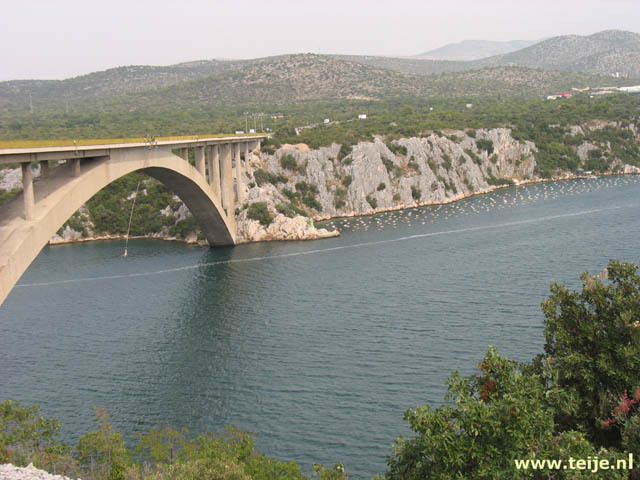 When we reach the peninsula where Zadar lies, we are totally fed up with the coastal road. More than 6 hours it has taken to cover a distance of 300 kilometers, curve after curve, mostly driving behind other cars and trucks. We think we know exactly how to drive to the same campsite as last year but we are mistaken and it takes us more than 15 minutes to find it; we also drive up to a heavily guarded military area where we are send back. In the end we find it and soon we find a nice place to put the tent. This campsite is quite large but it is busier than we had expected it to be. The people at the reception think we like to stay near the beach but we find ourselves a quieter place, not among all those other people. We send a sms to our friend Joshko and we will meet him tomorrow. Time to revert to the Italian conners: since refuelling we have driven almost 400 km. and the fuel meter is still far above maximum. What has happened there at the gas station? Something went wrong, that is clear. Since it wasn't a self-service we don't know what happened. We have paid too much and the float in the tank got stuck or did they maybe install another spare tank or something. Maybe we have to go to a garage next week, but first we are going to enjoy the time that we intend to stay here, until the end of next week.